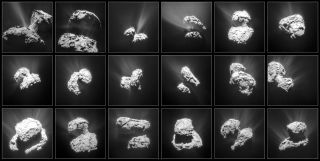 Activity increases substantially at Comet 67P/Churyumov-Gerasimenko between Jan. 31 and March 25, 2015, when this series of pictures was taken by the Rosetta spacecraft. The heat is on for the Comet 67P/ Churyumov-Gerasimenko as it sails ever closer to the sun, with the European Rosetta spacecraft snapping a stunning set of photos that the buzzing activity of the icy wanderer. A new montage of comet photos by Rosetta shows gas and dust erupting from Comet 67P as the icy object continues its approach to perihelion, its closest approach to the sun, later this year in August. Already the sun's warmth is making frozen ices evaporate into gas, which carry dust out with it. This creates an envelope of gas surrounding the comet, called a coma. "As the comet continues to move closer to the sun, the warming continues and activity rises, and pressure from the solar wind causes some of the materials to stream out into long tails, one made of gas, the other of dust," the ESA officials wrote in an image description. In August, Comet 67P will make its closest approach to the sun as it passes between the orbits of Earth and Mars. At that time, the comet will be about 115 million miles (185 million km) from the sun. "The comet's coma will eventually span tens of thousands of kilometers, while the tails may extend hundreds of thousands of kilometers, and both will be visible through large telescopes on Earth." The Rosetta spacecraft has been watching over the comet since arriving in August 2014, keeping an eye out now from a few tens of kilometers above the surface. In past months, it got as close as six kilometers (3.7 miles). It's the first time a spacecraft has spent an extended amount of time with a comet. In November, Rosetta released a lander called Philae that successfully touched down on the surface, but far off target in a shady spot. Philae fell silent when its solar-powered batteries drained a few dozen hours after landing. Rosetta has tried listening for Philae a few times in recent weeks, but with no success.